And i’m not just saying that because steak fajitas NEED guacamole. 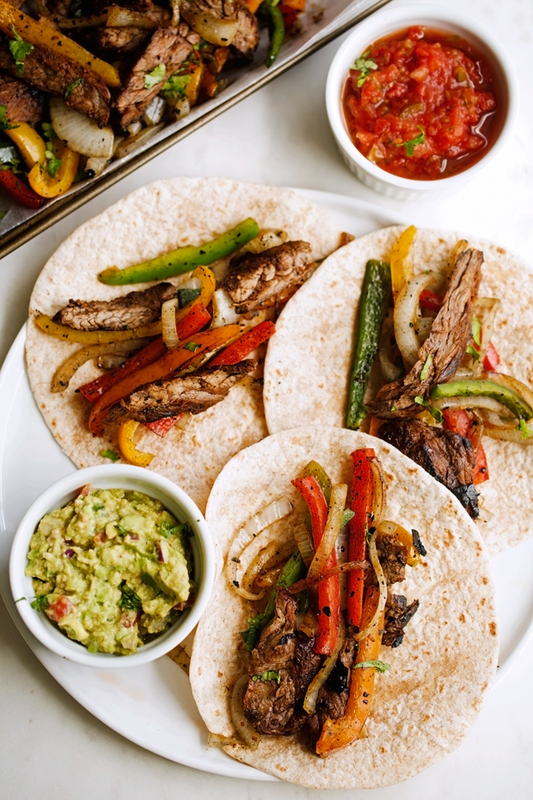 I’m saying it because you need these homemade fajitas. And I actually can’t believe it took me this long to make them for us. I mean, beef fajitas are a classic, and quite possibly the most delicious thing we’ve eaten around here… hands down… like EVER. So it’s totally my food blogging responsibility to bring these to you right now because they couldn’t possibly taste better than they do right now. These fajitas were gobbled up quicker than anything i’ve ever made before – that’s saying a lot because I feel like i’m ALWAYS cooking. And these make A LOT, enough to feed 4-5 people! We enjoyed them in tortillas the first day and turned them into to Chipotle-style fajitas bowls for lunch the next day and we still had some leftovers! And nope, i’m not even complaining about them. I’ll definitely be making these over and over again on repeat. 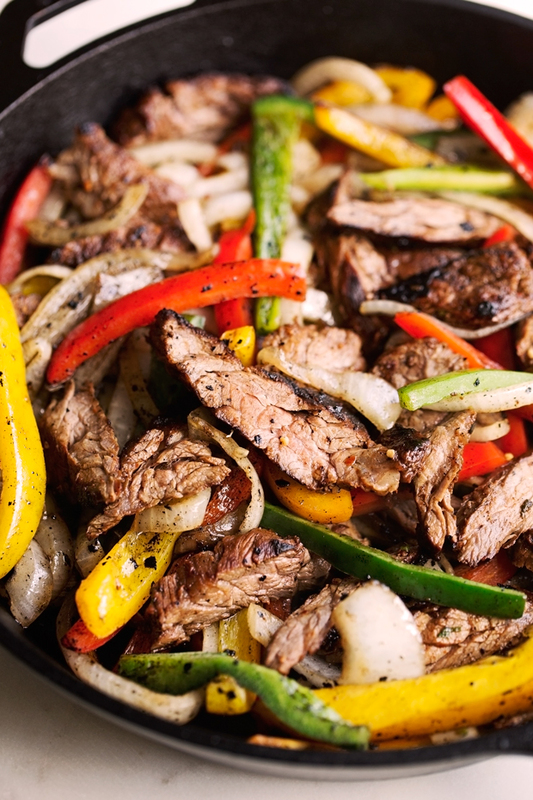 You’ve probably made steak fajitas with store-bought fajitas seasoning a million times before. 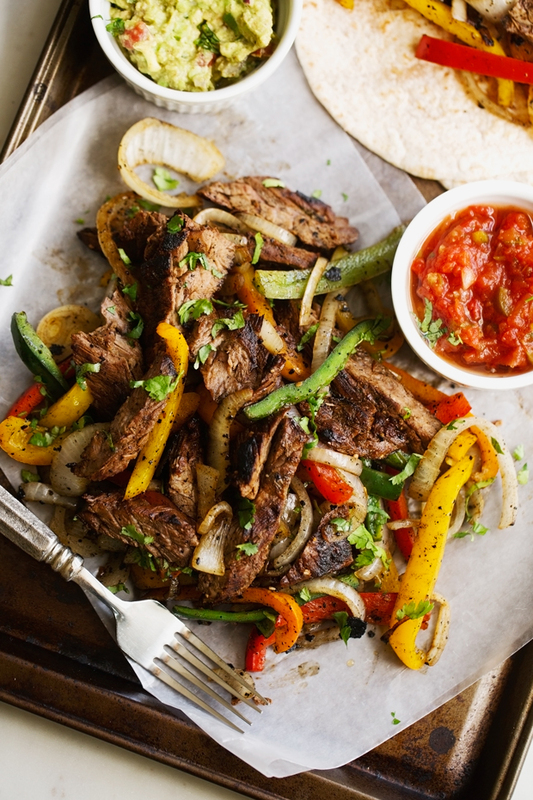 But i’m kind of reinventing this a little because my recipe is less focused on spices and more focused on overall ingredients that marinate, tenderize, and flavor the fajita meat. Because no one likes fajitas that are bland – sorrynotreallysorry. But this marinade! Oh my lanta! It is unlike anything you’ve ever tasted before. 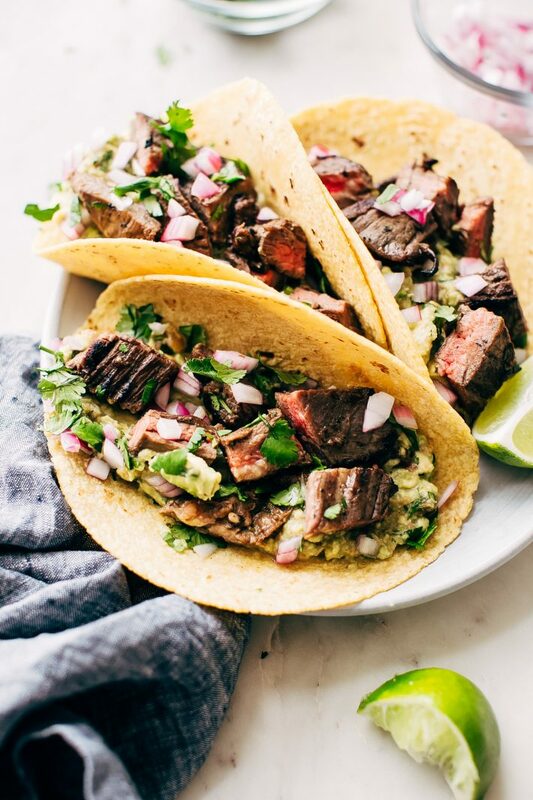 I was never convinced you could make restaurant-style steak fajitas at home and make them taste better but this totally does it. They are literally the BEST steak fajitas of your life. The ingredients are simple an straight forward. Also, this isn’t a Harry Potter potions class – you don’t need anything super fancy to make the best fajitas of your life. 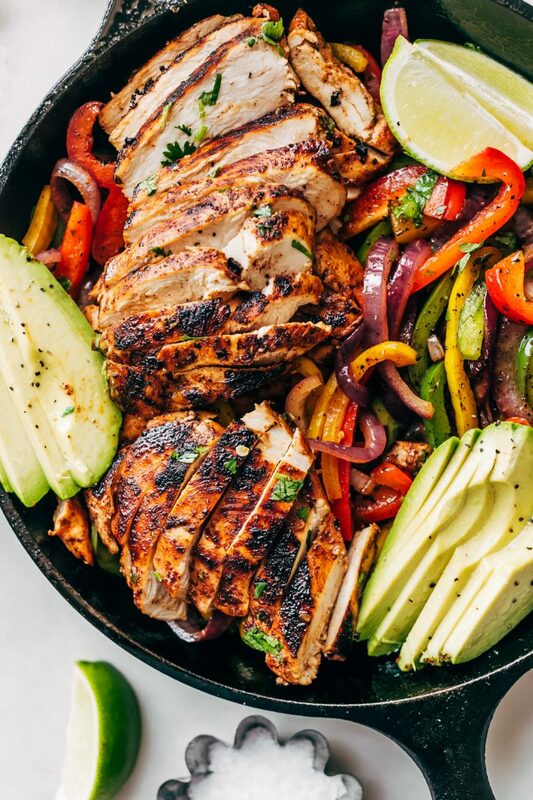 There is one ingredient in particular that I use that isn’t a typical ingredient one sees in a fajita recipe but give it a try, I promise you, it’s a GAME CHANGER. 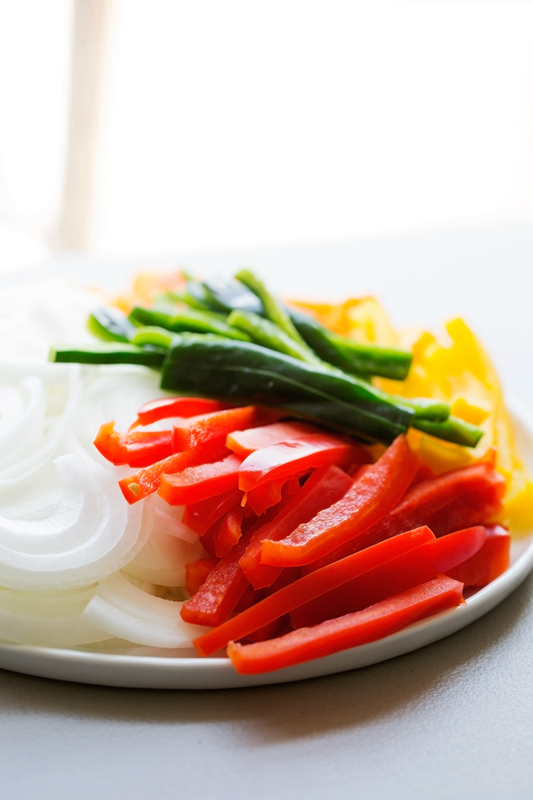 I like to use a colorful array of veggies for my fajitas. 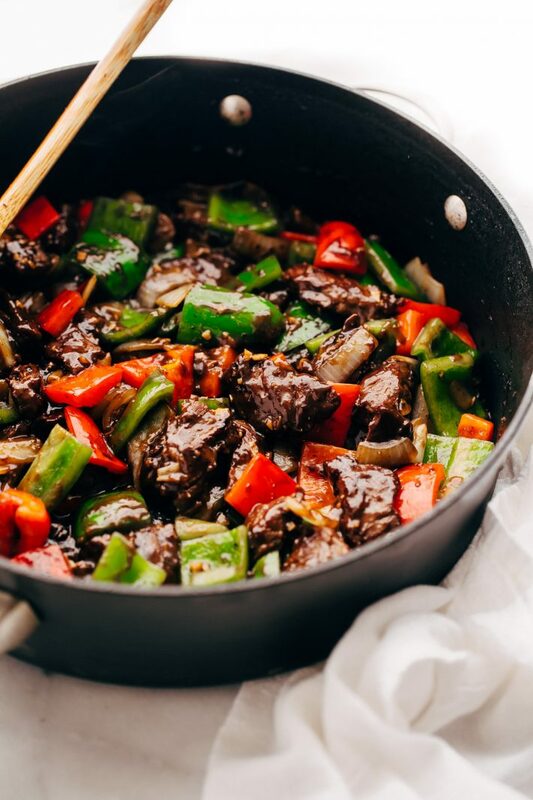 You can totally do with the regular red and green peppers if you’d like, but I love the color and the flavor that yellow and orange peppers add to this recipe. I’m definitely one of those people that eat with my eyes first. I also like to add in a BIG poblano pepper. Remove all the ribs and seeds so the spice is gone. We just want the nice smokiness of the poblano sizzled with the onions and bell peppers — the flavor is out of this world. I can’t believe I had been making fajitas without poblanos for so long before this. I almost feel like I cheated myself out of the best fajitas. Okay, let’s do a quick walk through on the ingredients and how you’re going to make the marinade for the fajitas. Without any further suspense let me share with you the ONE ingredient that makes my steak fajitas better than the rest — PINEAPPLE JUICE. Um, yup. You read that right. Pineapple juice, the stuff that comes in a small/large cans in the juice aisle. I use the stuff that is 100% juice with no additional sugars added. 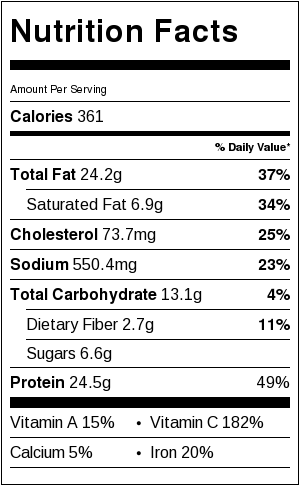 If you’re wondering what the function of pineapple juice is for fajitas, allow me to explain. 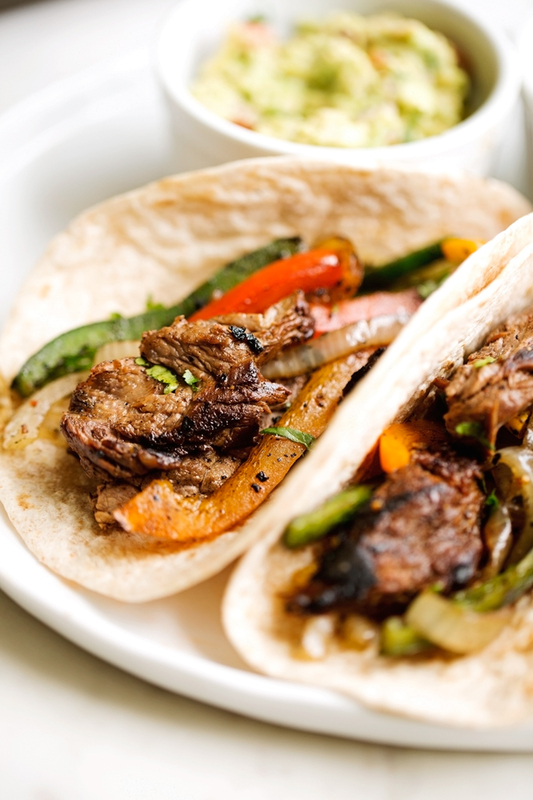 Store-bought fajita seasonings usually contain enzymes that help tenderize the meat. So to mimic that same tenderization without any weird ingredients, we use pineapple juice. There are people that argue, that fresh pineapple juice (that hasn’t been heated) works best. But honestly, for the purposes of our recipe, canned pineapple juice works just fine! No need to grab a fresh pineapple and make fresh juice, unless you’d like to that is. The other ingredients are simple! A little lime juice, some Worcestershire sauce (this is tex-mex style fajitas after all! ), garlic, chili powder, smoked paprika, cumin, a little olive oil, chopped cilantro, and a little salt and pepper. That is it! No cornstarch or sugar or a million other ingredients. These are simple, flavorful steak fajitas that shine on their own. You don’t need to put a million ingredients on them to taste good. Now the instructions – combine the ingredients for the marinade and let marinate. It’s that simple. I like to let fajita meat marinate for at least 4 hours and ideally sometimes, overnight. The longer you let them sit, the tastier they are. I made these indoors on a large cast iron skillet. You can grill the meat out on the grill in the summertime if you’d like. I know we definitely will once it stops raining here EVERY SINGLE DAY and once we purchase a grill. In the meantime, the cast iron skillet is making them just perfectly. ?? I use one large skillet to sear the meat, and while the meat is resting, I add in another tablespoon of oil and allow the veggies to sauté. I love the little bits of charred marinade to coat the peppers and onions. If you don’t want that, just use a separate skillet to make the veggies. Make sure to season them with a hint of salt and pepper. Be prepared to make this meal on a weekly rotation. Make it a Sunday tradition, because I have a feeling that this recipe is going to get 10 thumbs up. ?????????? guacamole ,salsa , cilantro leaves, salsa verde , sour cream, black beans, rice, tortillas, cilantro lime rice, sautéed corn, tomatoes, lettuce, shredded cheese, etc. STEAK MARINADE: Combine the ingredients for the marinade in a large shallow bowl. Give it a taste and check for seasonings, adjust to preference. Coat the steak with the marinade and let sit covered in the refrigerator for at least 2-4 hours and ideally overnight. Remove from the refrigerator 30 minute prior to cooking. Set a large cast iron skillet or pan over high heat and let heat up for a couple of minutes. Add the steak to the pan and fry on each side for about 3-5 minutes or longer if you’d like it more done. Feel for desired firmness. The 3 minutes/side will yield a medium rare doneness. If the pan becomes too hot, reduce the heat to medium high. Remove the steak from the pan and allow to rest for several minutes tented with a piece of foil. Slice the meat against the grain into thin slices. I like to do so on an angle so the meat slices are tender and thin. ASSEMBLY: Serve them in tortillas or on rice bowls topped with your favorite toppings!